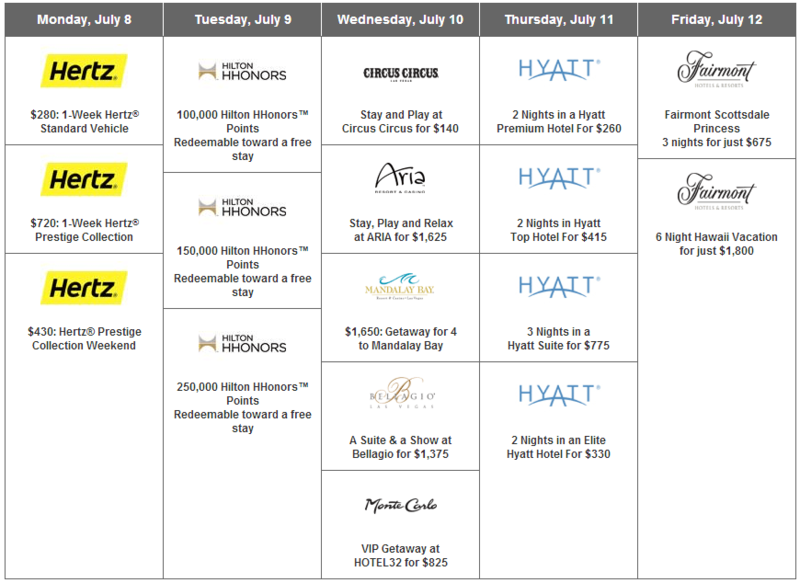 Daily Getaways Final Week Preview! I have to say I am pretty disappointed with what Daily Getaways has to offer this year. Not only are there more and more people trying to get packages, but the “good” packages are either not present, significantly devalued (Wyndham), or seriously a joke (Hyatt). Yes that’s right. There are Hyatt Gold Passport Points available, but there are less than 200 packages available. I mean, come on! I’d rather you sell Hyatt points at a higher price and let everyone have a bigger chance to get them rather than have such a small amount of packages available. Here are the packages that are available. This is interesting since they are points deposited into your account, which means you can split the reservation in to separate days if you want (although that will cost a slightly higher amount of points). But at $280 for a one week rental means $40 per day. If you consistently rent for a higher amount, it could be worth considering. Unfortunately, the minimum age for this offer is 25, which means I am ineligible. These packages mean you essentially buy Hilton points at around ~0.55 cents. Given the recent devaluation, however, top tier hotels are not that much of a steal with points any more especially with the top-tier Conrads/Waldorf-Astoria hotels going at 80,000-90,000 a night. They could be worth it if you are have a specific redemption in mind and know that you are going to get a better value, but otherwise it is not a great deal. As with all of the other Las Vegas packages there are potential deals to be had if you are intent on staying in a suite and splurging, especially with these packages several hundreds of dollars. Again, since Las Vegas hotels generally aren’t that pricey (and now that the MGM/Hyatt partnership has kicked in) I would say stacking an AMEX FHR/Virtuoso Rate with Hyatt Points/Stay Credit is probably going to be a deal that is as good if not better unless you are staying during peak dates (in which case even using Hyatt points might be worthwhile but that’s only when the daily rate is $500+ in my opinion). Ahh, and these are the packages I was hoping to buy. Fortunately, they are still a pretty good deal. Unfortunately, it is going to be a crapshoot trying to get these points. These packages means you are purchasing Hyatt points for 1.1 cents. Is it worth it? With 22,000 points for a top tier hotel like the Park Hyatt Paris or Sydney which regularly go for over $600 a night, that is a good deal. I am definitely going to go for these points even if I don’t have any redemption in mind since Hyatt points are so hard to get in Canada, but if you live in the US and have access to Chase credit cards definitely consider what value/saving you’re getting from purchasing these points. Note that Hyatt is having a sale on their points with a 30% bonus if you purchase through points.com for 1.85 cecnts each, so even if you want to redeem for the Park Hyatt and miss those packages it is still possible to get 22,000 points for just around $400. This is interesting as well. The Hawaii package is 6 days for $1800, which means $300 a night for a either the Fairmont Kea Lani or the Fairmont Orchid. I just did a search and the Kea Lani prices at over $800 during peak summer dates in August, so if you choose to go to Hawaii then that is a great deal. But then again, I see it for just under $400 during December, which means taking out an AMEX FHR/Virtuoso reservation (which should also qualify for elite credit) would likely be a better deal. I can’t say this enough, but just because the prices are lower than the estimated value doesn’t mean it’s a good deal. You have check what you want to redeem for (especially with when you’re buying points) before you actually pull the trigger and purchase. AMEX cardholders get an extra 10% off although there have been issues with using non-US credit cards. If you have any problems with that and you really want to get a package, consider getting a prepaid visa/amex in the States. You can access the full list of packages for sale here. If you liked this post, you can also signup for emails to get just one daily email for all posts! I am also on Facebook and Twitter – don’t miss any more posts like these! How are you going to go for these points when you need a US credit card and need to be a us resident? I tried this last year and was not successful in purchasing, even though I added a US address on my Canadian CC. I do have a US credit card. Just one without rewards, unfortunately. If you really want to get the packages, maybe you should look at getting a prepaid card in the US?